A frog sits upon its leaves to quietly observe the world around him. Koi play hide and seek beneath its flowers and stems. A proud gardener rejoices to see its big white or deep pink flowers in the pond. But me, I simply enjoy the beauty and variety that the lotus plant brings to my dinner table. Fresh lotus root is crispy and refreshing with a delicate taste. It stays fairly crispy even when cooked and it’s best to infuse lotus root with sauces or flavors which will enhance it. Like other vegetables, if I find organic lotus root, I don’t peel it. I simply trim off the tough end where these underwater rhizomes grow attached to each other. Once you cut your lotus root, either cook with it immediately, or keep it in a slightly acidic bath so it doesn’t discolor–such as a little lemon in some water. Truth be told, I thought of lotus root because I had the flu last week and wanted to ease some coughing. See how the vegetable has holes running end to end? They resemble lungs and traditional eastern medicine teaches that the lotus root is an excellent remedy for helping the lungs and quickly breaking down mucous. I made lotus root tea. 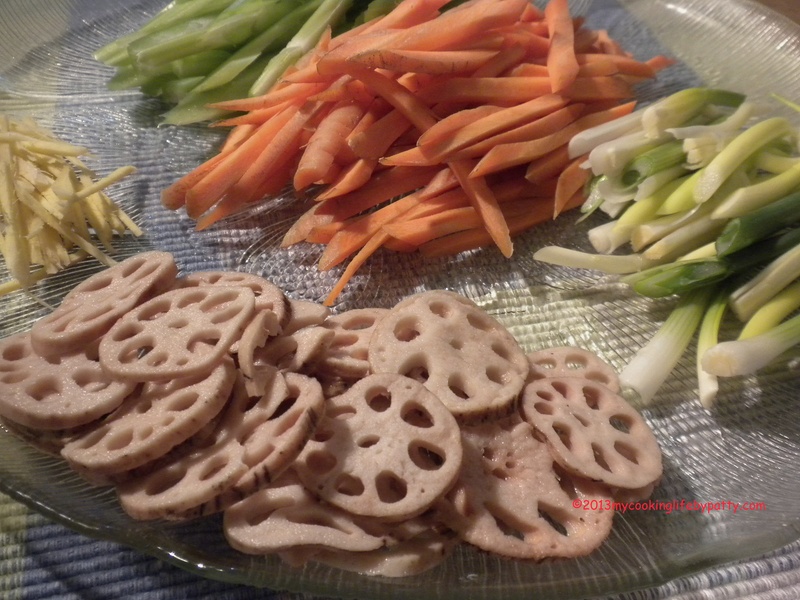 See how interesting lotus root is with its wheel or flower-like shape when you slice it? You can stuff those cavities with delicious things! You can float them delicately into an asian broth! You can deep-fry or tempura the slices, too! 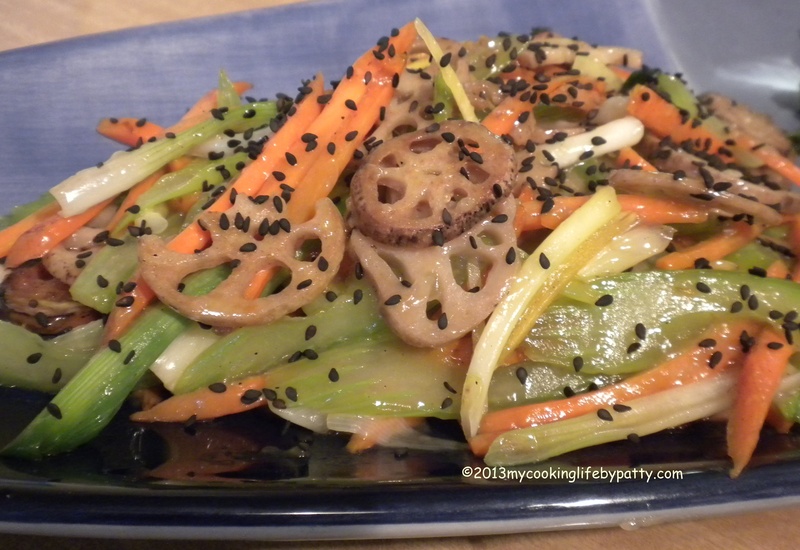 Using dried lotus root, I made my tea and then I made a stir-fry dish with the rest. Assemble all your stir fry ingredients before starting to cook. Wash and slice all the veggies and keep them separate. Heat up a wok, heavy skillet or cast iron pan with sesame oil. Use medium high heat but don’t let the oil smoke. Add the veggies one at a time starting with the carrots and a pinch of sea salt and toss them around, stir-frying them quickly for about 2 minutes. Add the lotus root and another pinch of sea salt, and stir fry another 2 minutes. Add the celery and another pinch of sea salt and saute until they are bright green, and add the ginger and chili flakes and stir fry. The cooking time is quick depending on how thick or thin you have cut your vegetables. You want everything to retain some crispness. At the last minute, add the scallions and stir them in with a small amount of soy sauce. Dissolve the kuzu in water until it looks like milky water with no more lumps. Pour the kuzu water into the stir fry and keep stirring. The kuzu will thicken and become clear instead of milky and will make a nice glaze for your vegetables. Sprinkle the sesame seeds over the dish and serve. We served the stir fry with creamy salmon and corn soup, and red kale with fried tempeh. 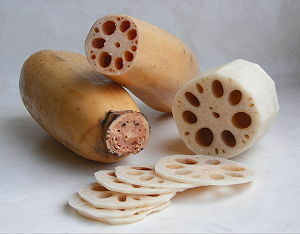 Lotus root is guaranteed to add interest and an exotic touch to your menu. What can you imagine making with this unique and decorative food?